Our investigational therapeutic treatment is based on epicutaneous immunotherapy, or EPIT. This potential new class of immunotherapy works by delivering biologically active compounds to the immune system through intact skin using the Viaskin technology. For those patients facing life-threatening food allergies, this potential immunotherapy treatment aims to desensitize them to harmful allergens by delivering compounds in small quantities into the outer layers of the skin. EPIT also offers a potentially strong safety profile because of how it works via the skin. Safety for food-allergic patients is paramount since the introduction of the offending allergen into their bloodstream can cause severe or life-threatening reactions, including anaphylactic shock. Source: Dioszeghy V, et al. J Immunol. 2011;186:5629-5637. Mondoulet L, et al. Immunotherapy. 2015;7:1293-1305. Viaskin safely provides allergenic information to the immune system without entering the bloodstream. Once applied to skin, Viaskin creates a condensation chamber that hydrates the skin and solubilizes the allergen allowing it to penetrate the epidermis. The solubilized antigen is captured by the Langerhans cells in the epidermis, thereby avoiding the bloodstream. Our mechanism of action aims to target specific epidermal dendritic cells, called Langerhans cells. Pre-clinical research has shown that these cells capture antigens and migrate to the lymph node in order to activate the immune system without passage of the antigen into the bloodstream. By delivering the allergen directly to the lymph node through the Langerhans cells, pre-clinical research has shown that EPIT activates specific regulatory T cells (Tregs) that can down-regulate the Th2-oriented reaction to the allergen. The absence of passage of allergens into the bloodstream may result in a favorable safety and tolerability profile for patients. Our Viaskin patch may enable continuous antigen exposure which has the potential to promote sustained desensitization. The Viaskin patch contains allergen protein in its original antigenic state, which allows the skin to be continuously exposed to the allergen over time. Because of its potential ease of use and safety profile, EPIT may offer a treatment option for patients suffering from food allergies, including very young children. This approach, if used for an early treatment of allergies in children, could also help prevent disease progression in these patients or the development of other allergies. Containing a dry layer of allergen in its center, the patch is positioned on intact skin, without prior preparation. 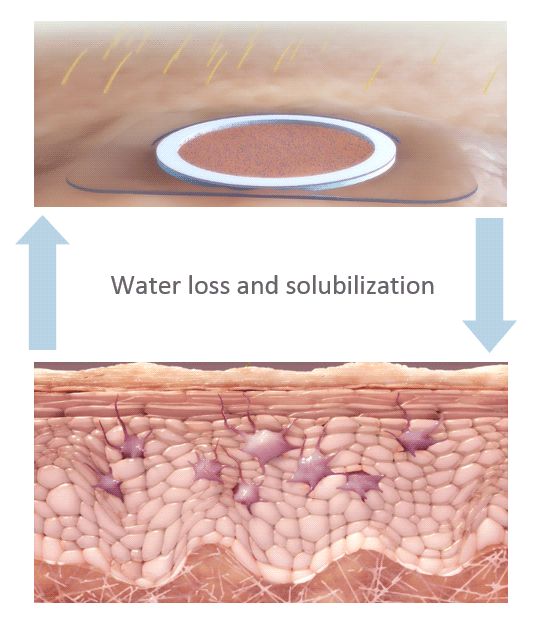 The condensation chamber formed between the skin and the center of the patch creates hyperhydration of the skin and an accumulation of water. The accumulation of water solubilizes the allergen. Due to this condensation chamber, the epidermis becomes more permeable allowing passage of the allergen into the epidermis. Once in the epidermis, the allergen is captured by a population of highly specialized cells: Langerhans cells. These cells can take the protein at the surface of the skin, process it and present its epitopes to the lymphocytes in the lymph nodes.